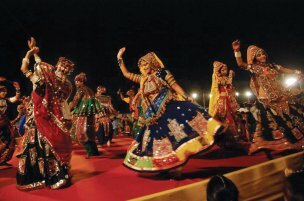 Of all the fairs and festivals celebrated in Gujarat, the religious carnival held in Shamlaji taluka under Sabarkantha district is extremely popular with Hindu pilgrims. The fair is organized in the month of November for a period of 4-5 days when millions of devotees visit the fairgrounds. The festival is generally held in the Kartick month as per the Hindu almanac and the night of full-moon (Kartick Poornima) is regarded as the most auspicious amongst all the days on which the event is staged. Pilgrims from all corners of the country as well as from abroad descend in droves, some arriving on foot, some on camelbacks, and via various other transportation modes. Religious-minded visitors sing paeans and hymns as well as dance in praise of Lord Shamlaji admiringly referred to as Kaliyo Deva (the dark deity) by the Bhils-the largest of all aboriginal Indian tribes. Shamlaji is actually a divine incarnation of Lord Vishnu, one of the Trinity gods in the Hindu pantheon in whose name the temple has been consecrated and the fair takes place. Pilgrims are witnessed flocking to the fair carrying pendants, ensigns, and standards emblazoned with the divine symbols of various gods and goddesses. Many devotees also take a dip or bathe in the Meshwo River flowing beside the Shamlaji Temple situated on its banks. The temple dedicated to Lord Vishnu has his depiction in black form called Sakshi Gopal or Gadadhar placed in the shrine’s sanctum sanctorum. The fair has tremendous significance from the perspective of commerce & trade as nearly 2 lakh pilgrims, mostly from Rajasthan and Gujarat arrive here to purchase household items, garments, silverware, and ornaments. Though the exact year when the fair was arranged for the first time is not known, it is alleged that the current temple was erected sometime during the 11th century by Solanki rulers. The shrine is believed to have been refurbished approximately 5 centuries back. One can see ruins of several other temples, ancient brickworks, and fractured idols in the vicinity of the Shamlaji shrine. Since the festival takes place in the month of November, tourists and pilgrims intending to be present at the fairgrounds should schedule a trip accordingly. In 2016, the fair will be held from 11th November-14th November (Fri-Mon). Shamlaji lies on the border between the states of Rajasthan and Gujarat and can be reached from Ahmedabad or Himmatnagar via NH8. The closest railhead is in Himmatnagar and visitors can proceed to Shamlaji by hiring a jeep or taxi. The Vautha Fair that takes place in the hamlet of Vautha in Gujarat’s Dholka municipality which in turn falls under Ahmedabad district, is essentially a cattle fair. Cattle heads comprising cows, donkeys, camels, and other domestic animals numbering in thousands are dressed up attractively before being herded to the fair. 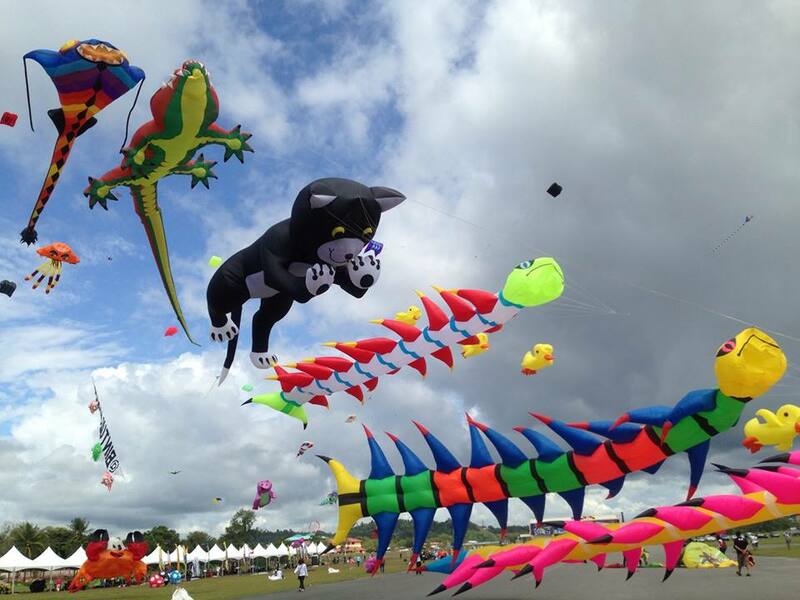 The Vautha festival is the largest of all the animal fairs that are organized on an annual basis in the state. These animals are sold with the aim of using the same in domestic and farm-related activities. Trading is conducted on the confluence of six rivers where the Vatrak joins the Khari, Majum, Shedhi, Hathmati, and Meshwo before draining into the Sabarmati River. Traders and visitors flock to the fair in all forms of transportation including jeeps, camels, buses, tractors, and bullock-carts. Traditionally, villagers from nearby hamlets have been camping up along the banks of the river and one can see tents spread in a radius of at least 3-4 square miles. The cattle carnival that goes on for about 5 days becomes an occasion for villagers to indulge in revelry and merrymaking with abandon. The rustics abandon their dwellings temporarily to put up at the fairgrounds and rustle up delicacies every day, the favorites being kachariyu and khichu. On the sidelines of the cattle fair, makeshift stalls are erected that sell everything from handicrafts to trinkets and from machinery to other knickknacks. 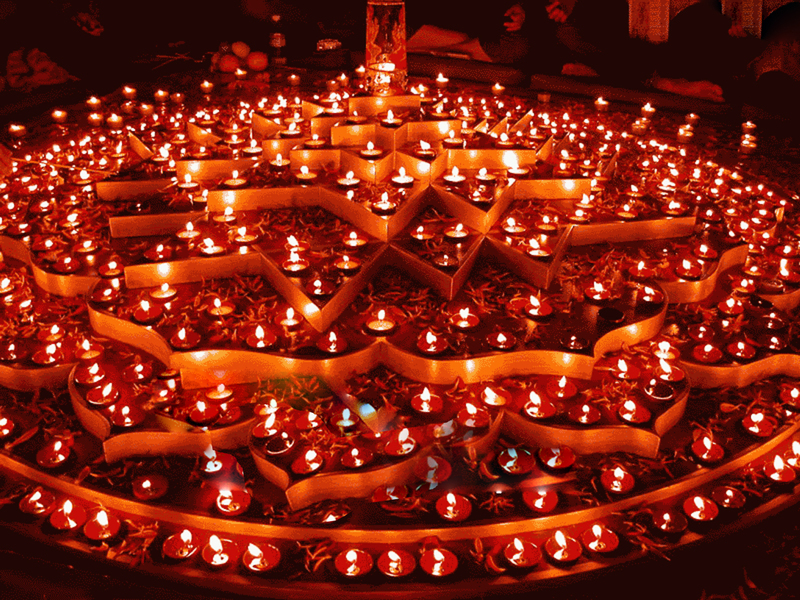 More than 30,000 people put up over 2,500 camps for the five days of the fair and in the evening diyas and paper lamps are lighted up to be set afloat in the river. The entire surroundings wear a resplendent look at night. The fair is arranged in the holy month of Kartick (November) and the night when the full moon appears on the sky is the most propitious day of the event. Hindus believe that bathing in the river or taking a dip during Kartick Poornima (the night of full moon) washes away an individual’s sins. If folklores or legends are to be believed, Kartick, son of Parvati (one divine form of goddess Durga) and Lord Shiva was enchanted by the natural beauty of the Saptasangam (the meeting point of the seven rivers). Consequently, he observed penance at the confluence of the rivers. Dholka, the closest city, is the place where the Pandavas of Mahabharata are said to have visited before ending their exile. The fair is held in the month of November during Kartik Purnima. The most convenient way to visit the fair is to reach Ahmedabad by road, rail or air and then proceed to Dholka from where the fairgrounds is about 26kms away. The Bhavnath Temple situated at the foothills of the Girnar Mountain range in Junagadh district in Gujarat is one of the holiest of Hindu shrines. Although pilgrims and devotees visit this holy temple throughout the year, the shrine witnesses maximum footfalls on two religious occasions-during Maha Shivaratri and for the period of ‘Girnar Lili Parikrama’. On the occasion of ‘Maha Shivaratri’ that is held sometime towards the end of February or beginning of March, Bhavnath fair is organized which lasts for 5 days. On the stroke of midnight, innumerable naked hermits known as ‘Naga sadhus’, pilgrims from all over the country and visitors from all corners of the world take a holy dip in the Mrugi kund (a water tank) before worshipping. Conch shells, incense sticks, rosaries, and other items of devotion are sold in the various temporary stalls in the fair. The entire surrounding has a divine aura as the hermits can be seen performing ‘hatha yoga’ and the place reverberates with the sound of conch shells. A ‘parikrama’ or a religious trek is arranged that covers a radius of approximately 36km keeping the Bhavnath Temple as the central spot. The parikrama held in the ‘Kartick’ month (Oct-Nov) begins following the hoisting of a triangular flag or ‘dhwaja’ on the temple premises where devotees traverse through forested sanctuary. After visiting several temples and places of worship, the pilgrims trudge their way back to the Bhavnath Temple. This trip initiates on the day that follows ‘Bijoyadashami’ and lasts for five days. There are no historical documents that specify the exact date when the Bhavnath temple was established. Going by local legends and folklores, a phallus (the cylindrical stony structure with a rounded head known as Shiva lingam symbolizing Lord Shiva) sprang up on its own. It is alleged that the raiment worn by Lord Shiva and his consort Parvati came to rest on the water-tank near the temple lending to the premises a divinity that has been revered since times immemorial. Devotees and tourists thronging the place are served with meals free of cost during the two religious events. A trip to the Bhavnath Temple can be planned either in Feb-March or during Oct-Nov around the time when the occasions are held. Alternatively, one can visit the shrine anytime between October and March. Junagadh can be reached by train from Ahmedabad, Veraval, Sasan Gir, Rajkot, Una, and Delwada. You can arrive at Ahmedabad by air (the nearest airport to Junagadh) and then proceed to Junagadh by train or bus. Bhavnath village can also be reached by state bus or private bus from the abovementioned cities. 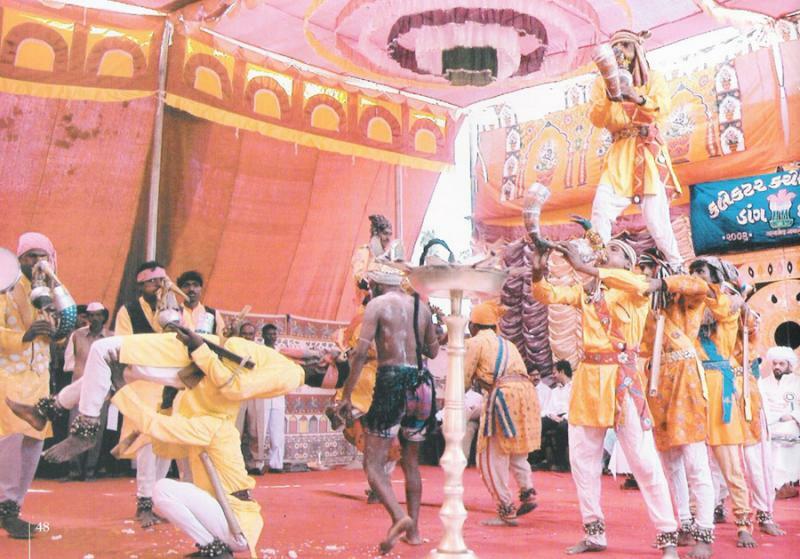 The Dangs Darbar fair is held annually on the hills of Saputara Mountain range straddling across the Ahwa region in Gujarat’s Dang district. 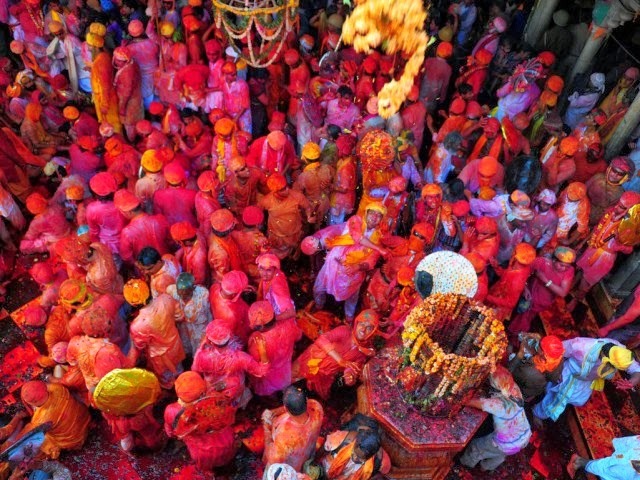 The festival is organized every year in the month of March, just prior to Holi-the Hindu festival of colors-by the tribes inhabiting the area around the Saputara and Dang provinces. It is a very colorful fair that is made vibrant and lively by the participation of several aboriginal tribes including the Gamits, Bhils, the Kunbis, and Warlis. The Dang Darbar festival or fair offers a splendid opportunity to all neighboring residents, visitors and tourists to interact and socialize with the tribal folks. At the same time, the carnival also provides a good way of catching up with the region’s social and cultural history. One can see the tribal men and women attired in their traditional garbs, dancing rhythmically in a concentric circle to the tune of wind/percussion instruments by holding one another at the back of the waist. The fair is inaugurated by the tribal chief with the District Magistrate presiding over the event. Apart from the ceremonial dance, the tribesmen and women sing songs and organize dramas and enactments. Chieftains from neighboring hamlets converge for a meeting or conclave after which a feast or banquet is held. The origin of the fair can be traced back to the colonial period when the British supervised a meeting of Naiks and Rajas hailing from the aforementioned regions. They were conferred with titles to honor their services to the empire and East India Company as well as received pensions for a lifetime. That tradition is still adhered to in letter and spirit amidst celebrations where tribesmen and tribeswomen wear colorful costumes as well as intricate silver jewelry. Ancient musical instruments like ‘Tadpur’ and ‘Kahalia’ are played along with dholaks, drums, and other percussion instruments. 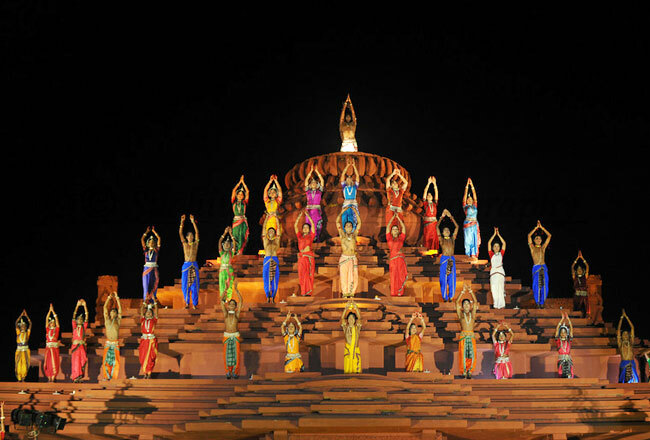 Time-honored dance styles like ‘ras’ and ‘garba’ are performed in the presence of tourists, tribal people, and merchants who flock to the event from nearby cities and towns like Daman, Surat, Khandesh, and Nasik. Since the festival takes place during the month of March, it is recommended to plan a trip during this period. In order to reach Saputara hills or Ahwa region where the festival is held, one should take a train to Surat. The city also has an international airport and is well-connected by roads with rest of the state and country. One can also proceed to Saputara (which is the state’s only hill-station) for catching up with the fair. 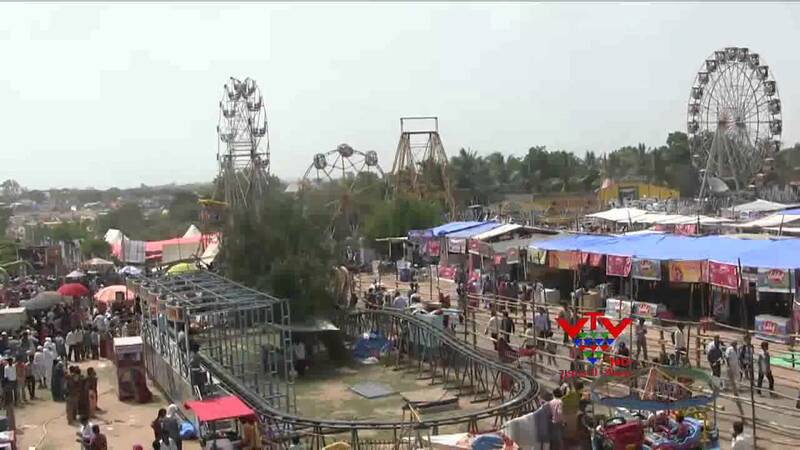 The Chitra Vichitra fair is held every year in the region surrounding the Gunbhakari hamlet in Khed Brahma taluka that lies in Sabarkantha district bordering Rajasthan. The festival is arranged fifteen days after Holi sometime around March or April, and commences on the night just before the appearance of the new moon or ‘Amavasya’. The festival is timed with the harvesting of the wheat crop that grows in the region skirting the Tribeni Sangam confluence of three rivers-Vyakul, Akul and Sabarmati that flow in the foothills of the Aravalli Mountains. A tourist visiting the fair can also visit the Brahma Temple situated at a distance of 30kms from the village. The closest major town from where the fair is held is Mehsana and Ahmedabad, the chief commercial city in Gujarat is also within driving distance. 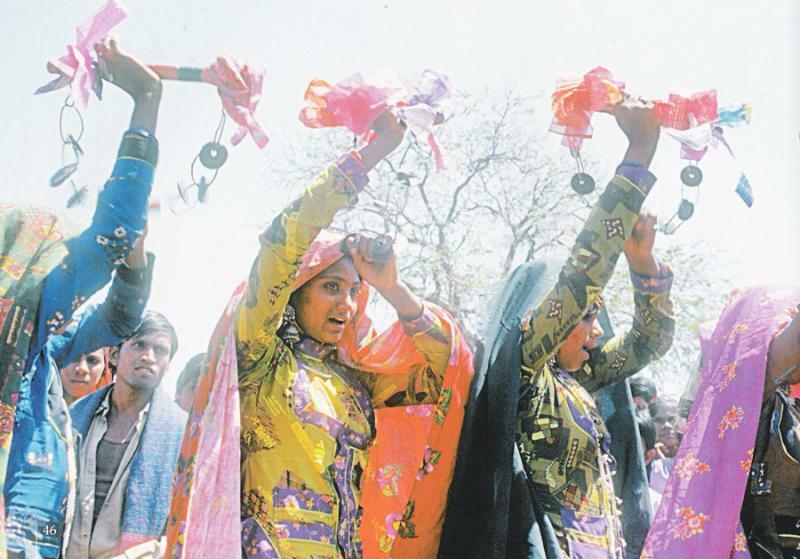 This is one of the most significant fairs to be held in the state of Gujarat where tribesmen and women belonging to the Bhil and Garasia communities. More than a million visitors and tourists throng to the festival. Tribal people can be seen costumed in colorful dresses performing traditional dances and singing tribal songs. Men put on dhotis, blue bush shirts, and saffron or red-colored turbans and women wear ghagharas, and turn out in exquisite silver jewelry. The incessant beat of drums reverberates throughout the whole area. The fair gets its name from two brothers Chitra and Vichitra who were sons of the Pauranic king Shantanu and the Bhishma, a significant character in Mahabharata, was their step-brother. It is alleged that the two brothers had settled down in the region and during the stay had been cured of their illnesses. The fair offers a perfect opportunity to tourists to soak in the celebrations of the tribal people and even take part in the festivities. Each and every group that partakes of in the festival carries their own instruments and the revelry goes on till everyone is tired to the point of exhaustion. Makeshift stalls and kiosks are put up which retail different types of delicacies, household articles made from copper and silver trinkets. The fair also provides an outlet where young men and women choose their life-partners. Couples are also known to have eloped from the fair. Since the festival is organized either in the month of March or April, it is practical to organize a tour during any of this two months. In order to reach the fair premises, one has to arrive at the railhead in Khed Brahma situated about 32kms away. 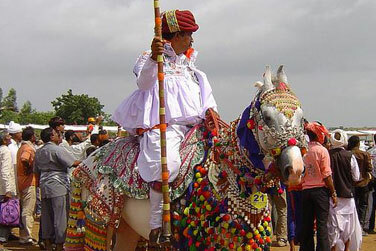 One can also proceed to the festival grounds from different districts of Gujarat via state or private transport.